Who appeared on the April 21, 1969 cover of New Zealand TV Weekly? New Zealand TV Weekly, April 21, 1969. 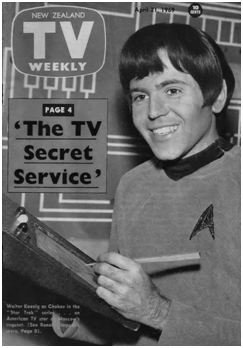 Walter Koenig, as Ensign Chekov, had the cover this time. The article inside: "Into American TV - At Moscow's Request!" Read more - In and Around Star Trek - in Chapter 24 of These Are The Voyages: TOS, Season Three.